So many lives have been touched by Shree Maa and Swamiji. The following represents a small selection of testimonials from seekers around the world who have offered their stories and expressions of thanks to Shree Maa, Swamiji, and the Devi Mandir. Thank you so much for the Chandi Path and it’s beautiful translation. There are no words with which I can express my gratitude. You have changed my life and I will be ever grateful to you for taking me to Chandi.Thank you so much for the Chandi Path and it’s beautiful translation. There are no words with which I can express my gratitude. I was thinking of you yesterday and how fortunate I am to be touched by your work. Later, I run into a lady at the grocery store who looked like your distant relative. The conversation lasted 2 hours, standing in the middle of the store. It was medicine. My sole felt so uplifted that I haven’t slept nor eaten much. I just wanted to express my gratitude today. Thank you so much for everything that you teach and do. You’re the best example of what it means to be spiritual, what it means to do sadhana. Truly, I’m blessed that you are a part of my life. Simplicity like Shree Maa and wisdom like Yours are very hard to find today, and I’m blessed to find them in both of you! I can go on praising both of you, words will never suffice to praise my beloved Gurus. Thank you! Thanks a lot! I love you both. Swamiji is ever steady with his chanting and pattern of pranayama/breathing. I sit with him in awe. Here are these few disciples sitting and praying, inspired by his example, and we have this privilege to be with this holy, holy, humble being. He keeps sitting tall, he doesn’t wiggle. I see him move just once to readjust ever so slightly his sitting. How I came to be here sitting and chanting with him and Shree Maa is ever mind-blowing. When I think of their stories, and here I am looking at them face to face, eye to eye, and in this quiet sanctuary—what a phenomenal blessing! Shubh Divali to everyone. May Ma Lakshmi continue to bless you abundantly. Through Her grace, so many of us are blessed by the work that you do. I’m writing to you because I have watched and enjoy many of the videos on your youtube channel! Over the course of the last few years I have been self-educating myself on Sanatana Dharma by reading various books and texts.The Devi Mandir videos are very informative and the amount of information about the deities and their history is amazing! Thanks so much for what you put out into the world! The Aparajita Stotram is amongst (although the only one I know of) the surest and shortest bridges to Immortality. If you happen to meet the Guru who has provided the English translation, please thank him/her for me. Given the nature of your gift, all I can offer is my speechless eternal gratitude. May the Supreme Goddess forgive me for the mistakes in my expression. My practices start in the morning with Shree Maa’s yoga and then chanting the the Sapta sloki Durga, Kavacam, argala stotram, kilakam, ksama prarthana, 32 names of Durga, siddha Kunjika stotram and Pranamah. I am now trying to expand with Navarna Viddih. Without Shree Maa & Swamiji’s blessing, I could not have done this! Their generous online classes on the website helped me a lot. They are always motivating and inspiring. A simple “Thank you!” is not enough for me to express my gratitude. You have given us so much and filled our lives with true meaning. Throughout the years, though I don’t see you physically, your words resound with love in my heart. I know all your expressions and I have developed much love towards you. Every day I remember you and you are always in my prayers. To me, you are a master of life. To you, I bow in utmost reverence and am proud to have you among my spiritual teachers. To me, your word equals the word of God. What an amazing resource shreemaa.org is! I feel blessed to be able to give a little bit. Thank you so much Shree Maa and Swamiji for your blessings. I know in difficult times it’s both of your blessings that stand by us to keep going. Thank you Maa & Swamiji for all the knowledge, love, blessings and support. You are the example in my life. Shree Maa is a pure example of Truth in the Kali Age. Beloved Swamiji – I love you Swamiji. You are like a father to me. Even my father never took so much interest in my development as you do. I bow down to you Swamijiji. You are just so special! What an extraordinary book (Living With the Soul)! I was in bhakti and tears most of the time! I went through the book heartfully, mindfully, truthfully! What a stunning personage! I was spellbound by her tales, her wit and her pithy, yet lethal doses of wisdom. I have yet to complete a few pages, but I could not resist the temptation to communicate Amala’s and my feelings. We are deeply touched by Shree Maa! Beloved Swamiji, You are my true Father and I love You With all my heart. Thank You, yet again, for Your wise counsel, Your loving kindness, and for the wonderful being of light, love and wisdom that You are. I am eternally indebted to both You and Shree Maa, and I have all faith that Shree Maa can move the stars for us. Both You and Shree Maa are such a precious blessing to all of your devotees at the Devi Mandir. You have my love and my immense gratitude. You have my Heart! I am 33 years of age and a Hindu Pandit in my country, Trinidad and Tobago. For the past seven years, by the grace of the Divine Mother, I have been able, with the co-operation of my Hindu community to perform Devi Utsav in Trinidad during Dussera. I would like to acknowledge that without reading your books, Chandi Path and Devi Gita, I would not have been able to fulfill my dreams of doing this yagna. This Devi Mandir is definitely a Rishi’s ashram, and I can tell that you, Swami Satyananda and Shree Maa, that you were both Rishis in your previous lives. Your Sanskrit pronunciation is impeccable and your explanations are full of wisdom. Your books are an extremely valuable contribution to Sanskrit literature and your devotion is unswerving. You maintain the highest standards of Hindu culture in the tradition of the Vedic Rishis, and your pujas and homas are in exact accordance with the descriptions of the scriptures. The work that you, Swami Satyananda and Shree Maa, are performing will be remembered by history as a tremendous benefit not only to Hindu culture, but also to all of mankind. I am a 35-year old Hindu Brahmin born and bred in England. Through your books and videos I have learned a tremendous amount about the worship of our mutual Ishta Devata – Maa Bhagavati. Therefore in the tradition of Hinduism, you are my Guru and I am paying you my respects. A sahasra (thousand times) thanks to you. I am incredibly and continually impressed with Swamiji and his answers. He is an absolute treasure of knowledge, very rare even amongst all the Indian Sadhus I have encountered — which have been more than a few. His answers are never more verbose than they need to be and they show such a seat of authority and great clarity. I am very thankful for all your help Swamiji and the online group is now a daily part of my life and a great resource for me in my own development of wisdom and furtherance of Bhakti. It has been a month since the India trip and I’m still at lost – I don’t know how to describe my feelings from meeting Swamiji and Maa and enjoying every single moment in the Kirtans, chanting Chandi Maa, participating in the Homa and receiving Darshans from them. This is the truest definition of “party”, and the best party I’ve ever been to! Also Swamiji & Maa, I’d like to thank you from the bottom of my heart for your explanation of the scriptures – for they answered (and they’re still answering) my doubts. In Benares there were devotees from many parts of the world and I met a small part of the Devi Mandir family. I met Maa and Swamiji for the first time and was overwhelmed by the energy they radiated. Their spirituality affected everyone, evoking the best in all of us. Their love, their way of making everyone feel special and welcome, their kindness, their simplicity and transparency have stayed in my heart and I bring home with me a deep feeling of peace and love. I fell in love with them, Maa with her intuitive remarks and Swamiji with his deep learned insights and both of them with their practical down-to earth approaches to life. Thank you so much for the beautiful Chandi Homa this morning. It was so powerful and precious, and assisted in dissipating the fear and grief we have been grappling with. We want you to know how very much we love you, and how deeply grateful we are for Your Presence in our lives. I was ever so grateful to be united with the ‘Shreemaa’ group during the trip to India, thank you so much for inviting me. At the Hanuman Temple chanting the ‘Sundar Kanda’ was so beautiful that I did not want it to end, the shakti, the energy, the ambience, the presence of some ’thing’, and energy so very divine that it cannot be put into words. The materials I have received from Devi Mandir have been so enriching to my practice and those I share with. Thank you for the joy they bring! But even more I wish to thank you for the enthusiasm you have renewed in my heart. 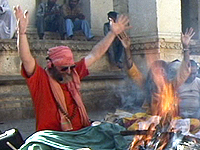 Sahib Sadhu and Enkindling the Yajna have done so much to put the party back in my puja! I have had the grace to experience the Divine Presence of many Sadhus in this life, but Swamiji’s generosity and enthusiasm of Spirit is something very rare and precious. I am amazed when I think about the positive impact that these two people have had on my path and continued spiritual growth. Swamiji is a rare treasure. I have completed the Siva Beginners Puja classes. I enjoyed it so much and have learned so much from them. It is now my sadhana. There is so much. But I find that I am spending a lot of time really getting to know it, memorizing the lines, the transliteration and the English and even the Sanskrit characters. I am also now following the Ganesa Puja classes and have read the Bhagavad Gita, in English 3 times. Thank you so much for giving me directions along the path. My complete love and devotion to Shree Maa and to you. I am very thankful to Swamiji as well as all his helpers. They have made it possible for me to chant and do puja on a daily basis and if you knew me you would know how difficult it is for me to discipline myself to have a regular practice. Swami SatyanandaSaras­wati, you are such a nice soul! Dear Swamiji and Shree Maa, YOUR labors are priceless! Day and night You perform Your selfless spiritual labors for the benefit of ALL. We are all so blessed for this, and the incomparable example and inspiration it provides. THANK-YOU! Just knowing you is a blessing, to have you as a teacher the greatest of fortunes, and to receive sadhana practice from you, a true grace. I bow to you over and over again. My heart called me to the Devi Mandir. It is a beautiful place filled with beautiful people and I am forever changed for having visited. Shree Maa and Swamiji selflessly offer everything they have to whomever will accept and the world is so blessed by their gifts. Thank you so much for all that you do throughout the year, for your inspiring teachings and example. It does our hearts good to know that you are in the world. You give us hope that we might reach liberation, and that all of the materialism and indecency of this world will one day fade like a bad dream. We pray for your welfare every day and commend you to the devas. Learning that my husband had deadly form of bone cancer was a horrible shock. For nearly a year the doctors had been telling us that the pain in Johnathan’s leg was just a torn muscle. Now at least we knew the truth: it had been a malignant tumor all along, a particularly virulent form of cancer that is nearly impossible to treat. As the grim diagnosis sank in, I thought of Kali, the Hindu Goddess who destroys everything that is less than divine. Suffering and death are two of the tools She uses to drive us back to God. There was a mantra for this Goddess that Shree Maa repeated constantly while we traveled with her in India. I asked Johnathan if he remembered it and he spoke the manta out loud. Before he reached the last syllable the phone started ringing. The last we heard, Shree Maa was still in India and was not expected back to the United States for several more weeks. It turned out two days previously she had abruptly changed her plans, flown back to her ashram in California, picked up the phone, and called Johnathan. We explained what was happening and the next day we had an extraordinary blessing of having Shree Maa, one of the most beloved saints of North India, visit our home in Sonoma. She and Swami Satyananda sat with Johnathan for hours, singing hymns to the Divine Mother, recommending protective mantras for us to chant and healing rituals we should perform. Placing her hand on Johnathan’s head, she gave him her blessing. Johnathan is fine now, though we continue doing our protective mantras and healing pujas daily just in case. Johnathan did have to go through chemotherapy and radiation treatment (which he sailed through effortlessly) because it was our karma to experience this medical crisis. Yet somehow Shree Maa shifted the course of reality so that the full impact of our karma was blunted, and the awful outcome the doctors originally predicted never happened. “She arranges the stars for you,” Swami Satyananda smilingly told Johnathan after the tumor disappeared. How amazing that in these dark and cynical times, saints like Shree Maa still walk among us. How utterly amazing! My first encounter with Shree Maa and Swamiji was last month, when my Gita study class was invited to visit the Devi Mandir. Before I returned from the Mandir, I “signed on” to complete the Peace Sankalpa, and nothing has been the same since. Once home, I started my recitations, sometimes silently and sometimes aloud. After a week or so, my 17 year old son started to imitate me, “only he was saying sarvaa bgjklfda plkdj mdnkjm.” In other words, he sounded out the first word and then just mumbled the rest. So I asked him if he wanted to learn the mantra, to which he responded enthusiastically — yes. He memorized it, and the English translation, in less than 5 minutes. He was quickly able to recite it quite fast and clear. This might not seem that remarkable, however, my son is autistic. He is fairly high functioning, and has pretty good language skills, but I can assure you there is no way that I can get him to recite anything that he doesn’t want to. I know, because I have tried!! He now says the mantra every morning upon rising, and it is the last thing he says as he falls asleep at night. I have suggested that he pay attention, and if he hears it in his head, to let it come through naturally. I also suggested that, if he is moved to do so, he can say it before his meals. If this continues to grow, I am going to get him a hand counter so he can keep track of how many he says each day. That is something I think he might like. Last month, Swamiji blessed him with the gift of a rudraksha bead for healing, which he happily (and seriously) wears around his neck all the time. He never stops talking about Maa. He listens to her sing, he wants to cook the recipes from her cookbook, sometimes he will sit next to me at the computer for the beginning of the Gita classes, and he keeps their picture in his room. Something magical is happening in my home, and to my son. Last night, in Gita class, Swamiji answered my question about “those with small intelligence” and their ability to reach God. (Ch.7, v.23). He said that those with limited mental capacity often have a pureness about them that allows them to see/know things more easily than the rest of us, due in part, to not having the same distractions the rest of us deal with every day. And yes, they can reach God. (This is my feeble paraphrasing, forgive me for not properly quoting Swamiji). My son is a very pure spirit, only seeing the good in others, assuming everyone loves him as much as he loves everyone, and now, he has connected to the loving energy of Maa. He has actually said to me, “Maa can see my soul all the way from California. I know she loves me.” He is so blessed. I am so blessed. We are all so blessed. Jai Maa! I just watched one of your video classes again and I am overwhelmed with gratitude for the knowledge and wisdom you have made available for devotees all over the world. I must tell you, or I will burst. You are my inspiration, my compass, and I continue to learn so much from you. I am almost 55 years old and your books have given me enough material for the rest of my life to study and many treasures to discover as the texts slowly become my own and I hear God speaking in my heart. When I get down, you raise me up again. Recently, an elderly lady in our apartment complex died as a result of violence and I had felt a bit shaken. But when I read your response to another devotee’s question on the online group about a shooting, my doubts and fears were dispelled. I must tell you, my heart is overflowing, I love you very much! continue to do for me. try to please you every day in every way. Sundari recounts her experience with cancer and receiving the ultimate blessing from Shree Maa. Deepa recounts her husband’s experience with cancer and the depth of Shree Maa’s love. I’ve been learning so much from your video classes on the Chandi Path. Thank you for being so generous with your wisdom and for reflecting the path of Bhakti so purely. I have attended last two of Swamiji’s classes on Cosmic Puja and I can only say, “What a privilege!” I feel transported in time to the ancient Vedic times where you sat at the foot of a rishi and learned from him. In this day and time it is a privilege and I cannot thank Swamiji and everybody enough for hosting these classes. Maa and Swamiji’s presence come through every class and broadcast to bless and protect us wherever we are tuning in. I am thoroughly enjoying Swamiji’s class on Cosmic Puja. It is such fun to be home and tune in to the broadcasts, like watching the latest episode of a favorite show on TV. I was able to have Darshan of You and Shree Maa on the webcam. It was so amazing that I could see it all live! The feeling is hard to describe. Thank you, Swamiji for making it available to all corners of the world. Swamiji, I have just finished watching one of your classes on the Chandi Path and I am so blessed. Your teachings are so full of Divine wisdom and are a treasure trove of spiritual wisdom. I was truly mesmerized by the greatness of your teaching. I had other things I had to do, but I could not tear myself away from your Chandi Class. Your teaching is so inspiring it mesmerizes me! I have been watching the webcasts for the last 3 days and am completely entranced. I can’t wait for the broadcasts to start each day. I wouldn’t miss your class for anything in the world! You are the most divinely humane Swamiji I have ever met. It is a privilege attending your class. Last night I completed the Lalita Trishati Stotram video. From the 181-st name you began making offerings to the fire. I loved it. It was as though I was sitting across from you at the havan kund (Pit for the Sacred Fire). I began pulling offerings out of my heart and putting them in the fire along with you. It was fantastic. Thank you for giving me the privilege to learn from you. I am continually in awe of the great knowledge, the sincerity, the enthusiasm, the consistency, and above all, the loving devotion that you bring to each class. Your words have changed my life. Thank you so very very much for broadcasting these teachings. I used to come for all the darshans when you and Shree Maa traveled to Chicago years ago. It was these darshans that first opened my heart and caused me to weep. These bliss tears just keep on falling, a beautiful blessing with beautiful teachings. What a spectacular ceremony and celebration yesterday! You provided a tremendous a service for your friends and family. It was such a gift to experience the light, love and powerful energy of Shree Ma and Swamiji that filled your home and surrounded each of your guests. I was moved beyond words. Especially during the part about peace near the beginning of the ceremony. At another point, my chest became very warm and pulsed. So many visuals, sensations and shifts! Plus, It was a blessing to assist with the preparations. Thank you. I am writing to congratulate you all on the wonderful work you are doing at the Dewi Mandir. I wish you all the wise counsel of the Almighty in everything you do and the strength and motivation to do so. I recently ordered a copy of the Chandi Path and received, along with it, a CD of you telling Sadhu stories. I wanted to let you know how much I’m enjoying it. When I was small, I listened all the time to fairy tales on tape, with sound effects and music, just the way you tell the sadhu stories. Listening to stories like this is still one of my favorite things. And, not only are they enjoyable, but the lessons were much needed. Many thanks to you and Shree Maa. Yesterday I received the CD of the Kali Sahasranam. I was not prepared for how beautiful Shree Maa’s delivery of Mother’s Thousand Names would be. A peaceful joy swept over me as I realized what a spiritual jewel I was listening to. I have so much to thank you for in regards to the Guru Gita. I wanted to point out that the copy of that book was sent to me free with an order I had placed with Devi Mandir. I probably would never have ordered that book, if you hadn’t sent it, which means I would not be reciting the Guru Gita now! You and ALL the people of Devi Mandir are always giving and never taking – something to emulate indeed. love, you are my inspirations in life. have a beloved Guru of my own. I also have a Sanskrit teacher who taught me Vedic chanting. to chant the entire thing. It was wonderful. perfect and makes every easily accessible. I have contacted you before and just wanted to let you know a bit about my progress since then. I have completed the Siva Beginners Puja classes. I enjoyed it so much and have learned so much from them. It is now my sadhana. At first I planned to do it for forty days and then, perhaps, do something else. There is so much. But I find that I am spending a lot of time really getting to know it, memorizing the lines, the transliteration and the English and even the Sanskrit characters. I’m not so good at drawing them yet but I love the time it spend with it. I am also now following the Ganesa Puja classes and have read the Bhagavad Gita, in English 3 times. Thank you so much for giving me directions along the path. My complete love and devotion to Shree Maa and to you. Your Life with Four Easy Budgeting Steps” article. Thank you very much for providing this information and these tools! If I am on the internet then I am reading or viewing a video on shreemaa.org, I rarely visit any other web site because on shreemaa.org I learn what I love and I love the things I learn. I have developed such a deep love for our Divine Mother. I love Her with all my being, I love offering devotion and prayers to Her, I love my sadhana, I found a way of life that I love.